Barack Obama dethroned from the top of the list that features Sonia Gandhi, Manmohan Singh, Dmitry Medvedev and Igor Sechin. Russian President Vladimir Putin has been rated as the most powerful person in the world, according to the latest Forbes List of Most Powerful People. 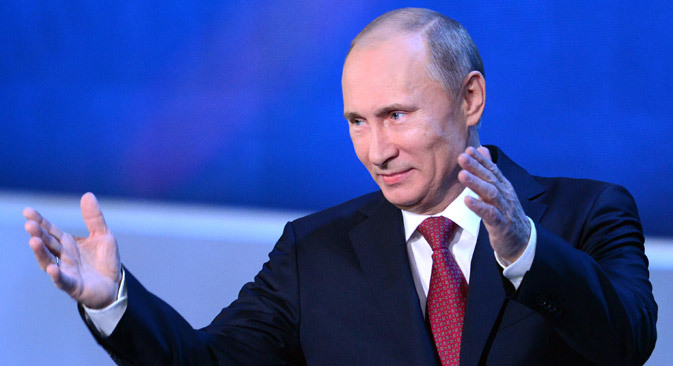 Putin dethrones US President Barack Obama, who topped the list last year. Obama is second on the list, followed by Xi Jingping, General Secretary of the Communist Party of China, Pope Francis and Angela Merkel. Others in the top ten include Microsoft-founder Bill Gates, Chairman of the US Federal Reserve Ben Bernanke and Saudi Arabian monarch Abdullah. The highest ranked Indian on the list was Congress party president Sonia Gandhi, who at 21 was ranked 7 places higher than Prime Minister Manmohan Singh. Gandhi fell 9 places from last year on the list from 2012. “Rumors persist of a rift between her and soft-spoken Prime Minister Manmohan Singh, with many expecting Singh to leave office before the 2014 general elections,” the magazine said. “Son Rahul, heir apparent in the nation's most famous political dynasty, recently snubbed Singh publicly,” it added referring to Rahul Gandhi’s objection to an ordinance that would have allowed convicted lawmakers to stay in parliament. Manmohan Singh fell 9 places to 28 on the list. “Singh's quiet intellectualism renders him a timid public figure,” Forbes said. Other Russians featured on the list include Prime Minister Dmitry Medvedev at number 53 (who fell 5 places from last year), Rosneft Chief Executive Igor Sechin at 60 and Alisher Usamanov, founder of Mettaloinvest at 63.